Facebook, Pinterest and blogs everywhere are full of posts about ways to incorporate coconut oil into our diets. If you're like me, you have a sweet tooth with an affinity for CHOCOLATE! Most chocolate that is available in the market has added sugar so it's off limits for me right now...but I NEED some chocolate. 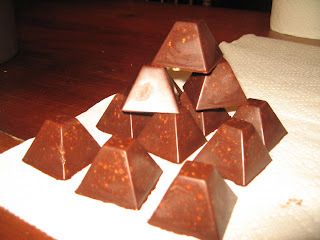 My daughter has been making some pretty tasty coconut fudge type treats and I love them! But she's away this week so I decided to try my hand at some good for you "candies" on my own. And have you seen the newest jello molds? They look like little, flat topped pyramids. As usual, they're free if you buy a few boxes of jello. Melt these together in a double boiler just until the oil is liquid so we don't kill the beneficial ingredients in the raw honey. Blend these well so the honey doesn't separate in the mold. 3 tsp. maca (because menopause has not been kind to me! Based on my calculations, that gives you about 600 mg of maca per pyramid. Stir these into the oil and honey blend. (combined)of nuts, coconut flakes, dried fruit, seeds. I used pecan pieces, dried cranberries, coconut flakes and toasted buckwheat for a crunch. Of course I was so excited to experiment with this that I nearly forgot to take pictures! Here's all the ingredients mixed together in my double boiler. 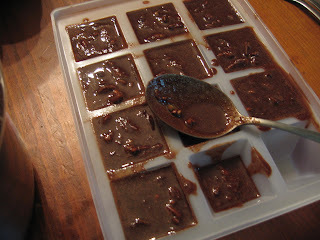 Once combined, spoon them into the mold stirring well in between to keep things from falling to the bottom. I found that each jello mold holds about a tablespoon of this precious, "good for you" treat. It's a little messy but smells so good! know how they turned out before I publish this post! After 15-20 minutes in the fridge, they popped out of the mold. Aren't they cute?! 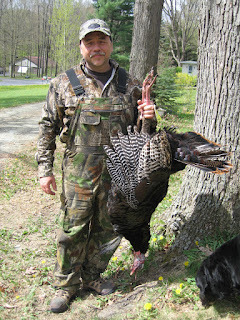 Here's my hubby with his spring turkey. My husband is a working guy and he does his best to work all the extra time he can to provide for our family. This year, he set aside a few days to do things he usually misses...like spring gobbler hunting. As you can see from the photo, he got a nice sized bird! But since time is usually at a premium, he decided to fillet the breast meat and save the legs...all the way down to it's talons, but more on that later. Since his family all enjoy wild game, he asked me to prepare his turkey for the family reunion. So I started looking around for some ways to prepare wild turkey breast, usually very dry meat, so that it would be juicy. Here's my take on some of the things I read. I started by marinating the breast meat in a blend of white wine vinegar, a little balsamic vinegar, some vegetable broth and a splash of maple whiskey(optional). Don't ask me how much...I was experimenting! While it was softening up in the brine, I roasted an onion in my deep, cast iron skillet with a lid. (A fond memory from Wally's grandma.) It turned all translucent and a little caramelized...smelled heavenly! After two hours marinating in the vinegars, etc. to break down some of those tough wild bird fibers, I poured the brine in to a jar and browned the breast meat quickly, in the onion pan. On top of the meat I added sliced portabello mushrooms, the onion, and strips of bacon to cover the top. Then I added some of the brine back into the pot, drizzled some of our maple syrup lightly over the top and roasted the open pan at 350 for 2 hours. It was yummy! So juicy and tender! Wally's Turkey seemed to be a hit with many of the hunter's at the reunion and some of their wives, too. Second score of the weekend! I tried this recipe, too and it is DELICIOUS! and then make it, right away! This recipe is from Pinch of Yum and you can find the original here. Here's what Goosie asked for for her 22nd birthday...I'll let you know how they turn out. Click on each recipe for the link. We're making the raw food carrot cake and topping it with the honey/cream cheese frosting. This raw food carrot cake is really good and very filling! These little cupcakes are very good on their own – soft, light and moist, with tiny specs of grated chocolate, but simply outstanding when frosted with this super-creamy honey cream cheese frosting. What makes the frosting so special is the absence of icing sugar. Instead, I’m using raw muscovado (light brown sugar can be substituted, if the muscovado is unavailable) and honey to sweeten the frosting. The end result is the clean-tasted and truly luscious frosting, without cornstarchy powdery texture that I dislike in any icing sugar-based fillings. Center an oven rack and preheat the oven to 350F. Fit parchment mini-cupcake liners into mini-cupcake molds. In a medium bowl, whisk together the whole wheat flour, all-purpose flour, baking soda, baking powder, and salt. Set aside. In another bowl or measuring cup, combine the banana puree, buttermilk, and vanilla extract. Set aside. In a large bowl, beat the butter with an electric mixer for a few seconds, until creamy. Gradually add the sugars and beat until light and fluffy, about 5 minutes. Beat in the honey and continue mixing for another 2 or 3 minutes. With the mixer on medium, add the eggs, one at a time, beating well after each. Reduce the speed to low and add the dry ingredients in three additions alternating with the banana mixture, starting and ending with the dry ingredients. Scrape the bowl as necessary, and beat only enough to incorporate the ingredients after each addition. 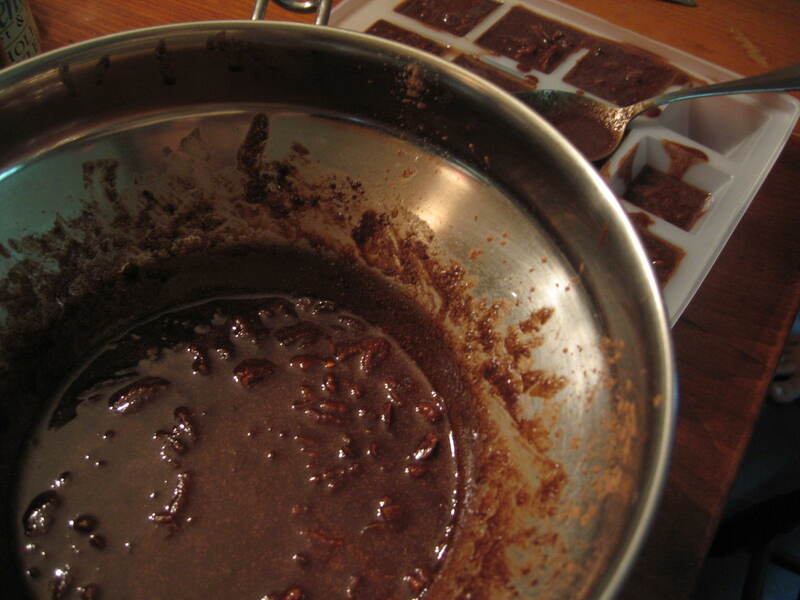 With the mixer on low speed, mix in the grated chocolate just until combined. Transfer the cake batter into a large pastry bag fitted with a large plain tip and pipe the batter into the prepared molds filling them about ¾-full. This is the easiest way to equally divide the batter between so many mini-muffin molds. Although you can also use a spoon. Bake the cupcakes for about 18 to 20 minutes, until puffed and a cake tester comes out clean. Cool the cupcakes for 5 minutes on a cooling rack, then unmold and cool completely on the rack before frosting. In a small bowl, using electric beaters, beat the butter until smooth and creamy. Set aside. In another bowl, using the same beaters (no need to wash them) beat the cream cheese with the muscovado sugar until light, creamy, and completely lump-free. Beat in the honey and vanilla extract. Stop the mixer and scrape the sides of the bowl as needed. Beat in the creamed butter just until the ingredients are combined, should take less than a minute. Transfer the frosting into a piping bag fitted with a large star tip and pipe a rosette over the top of each cupcake. Refrigerate to firm up the frosting a bit, for about 20 minutes or so. The cupcakes can be made a day in advance and kept in the refrigerator in an air-tight container. Remove the cupcakes from the fridge 30 minutes prior the serving time. Super Food Packed Raw Vegan Carrot Cake Recipe ? To make the cake batter: Soak the raisons and the dates, in separate bowls each in 1 ½ cup water for 5-10 minutes to soften. Drain the soak water and set aside. Using a juicer, juice about 20 carrots in order to acquire the 4 cups of carrot pulp needed and drink the carrot juice ? In the vita-mix grind the almonds into a fine mill. Add the dates and one cup of the raisons and grind until you have a smooth paste. In a large bowl, mix with the carrot pulp, vanilla, cinnamon, nutmeg, cardamom, lemon zest, orange zest, sea salt and walnuts, and the remaining one-cup of raisons. To make the frosting: Soak the cashews in 2 cups fresh water for 30 minutes. Drain and rinse. and ½ cup of the date soak water, orange juice, lemon juice, lemon zest, and vanilla until smooth. Add a touch more of the date soak water if necessary to aid in blending. Add powdered coconut and blend well. It may be necessary to help the blending along by scraping the sides of the blender with a rubber spatula and continue to blend. 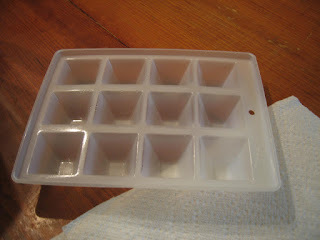 Allow to stand in the refrigerator if necessary to thicken. To layer the cake: Split the cake batter in half. Line a serving platter with plastic wrap or waxed paper. Press half of the dough into an even circle. Slip pressed dough on plastic wrap or waxed paper off the platter. 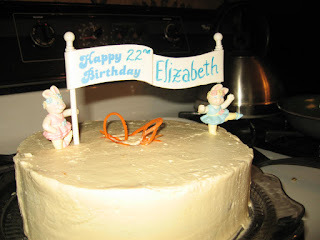 Press the remaining dough directly on the platter into an even circle for the bottom layer spread just less than half of the frosting on the bottom layer leaving a 1-inch border. Delicately flip over the layer on the plastic wrap or waxed paper onto the frosted layer. Re-shape any mishaps and smooth the sides. Spoon the remaining frosting on top of the cake and spread evenly over the top and sides. If you wish, this cake can be prepared into one layer. Press the cake dough into an even circle on a serving platter, and frost evenly. For best results, allow chilling and setting in the fridge for one hour or more. Stencils can be used to create designs. Cut starts, hearts, and spirals out of cardboard and lay on the cake before sifting, or sprinkle with ground almonds and cinnamon.